Yes, I did it (again). The cabled cardigan that had been finished for christmas and had not fit at all is now finished again. And now it does fit! 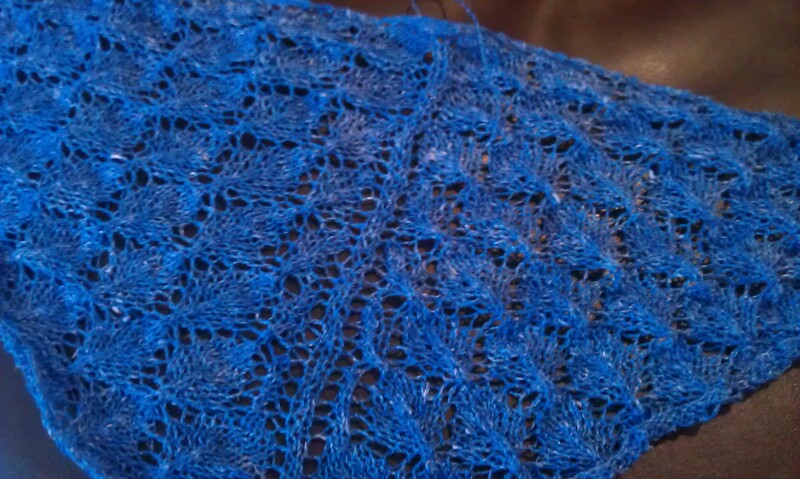 I seamed it yesterday so I haven’t got a proper wearing picture yet which is why you only get to see a detail. 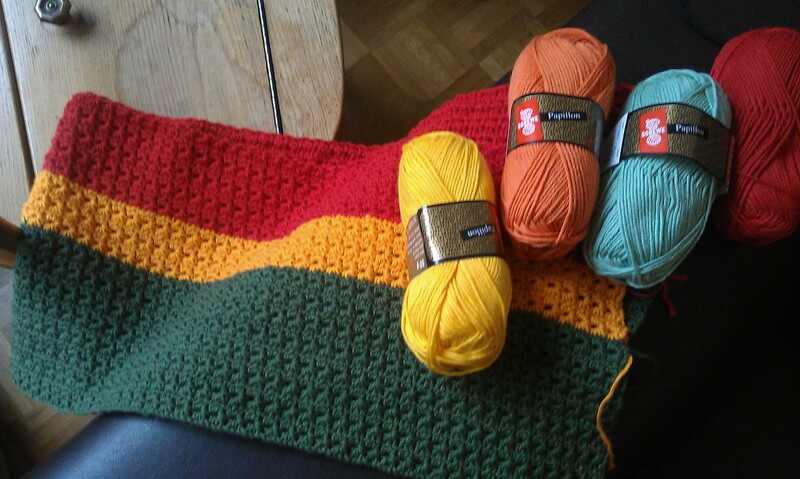 Now to something that I already started some weeks ago but did come far yet: after crocheting the baby blanket I wanted one as well, a big one. And here they are, the first rows of my big blanket. It is going to be soo colourful! I just don’t know if I will really use the yellow yarn… Right here on the photo it doesn’t seem so fitting anymore. And now that the cabled cardigan is finished all that I need is a proper clothing project. Now I wanted to join a KAL that should have started on the first of April but as I hadn’t received any starting information yet I started another 25 years old yarn project. I found those rests of Angora yarn and this fitting Angora Raglan Top pattern on ravelry. 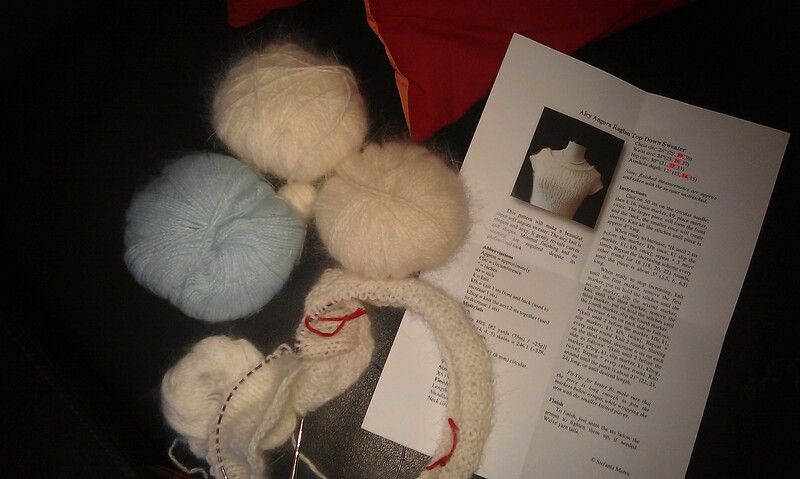 Keep your fingers crossed for me that the wool is enough. Weight-wise it should work but my stitches, being as airy as possible only gave half the gauge I needed (which makes it easy to adapt the pattern at least) and I’m not too sure what will happen here… We will see. The Business Casual Socks have become a travelling project because they fit in my handbag very well and I’m still reading Little Miss Undercover and it is quite entertaining even though not as funny as described. Joining as usual Ginny’s Yarn along. This entry was posted in Knitting & Crocheting and tagged Blanket, Cardigan, Crochet, Knitting, Lace, Top, Yarn Along by kathatravelling. Bookmark the permalink. 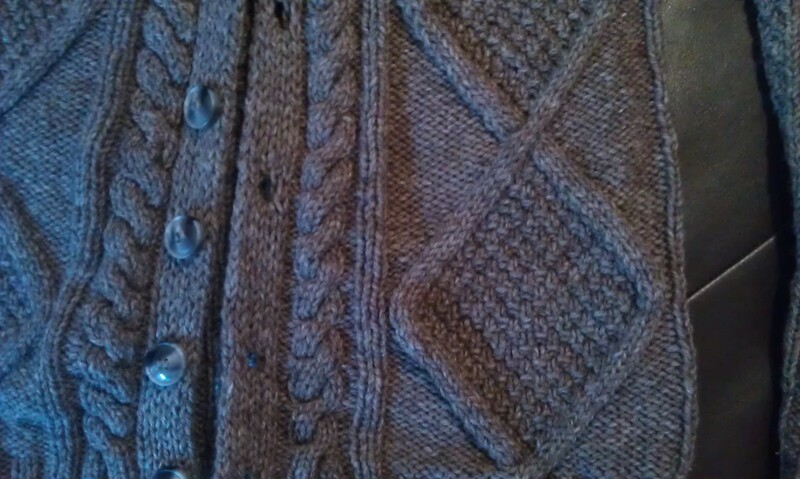 I love the cardigan cabling! I really want to try an intensely cabled sweater soon but I’m concerned it will be really hard to keep track of, do you have any tips? Intense cabling is no problem as long as keep track of where you are. In this sweater for example the small braid had to be turned every 6 rows and the big cable squares turned every 44 rows. So whenever I started a row I wrote down something like 1/1 (row one for small plaid, row one for big cabling) or e.g. 5/43. Like this you know when to turn and where you are. And you can mark rows where you increase or decrease. Normally I only count the rows when knitting anything that needs a second one in length (back and front o a sweater, arms, socks…) but for cabling really putting a number to the row helped me a lot. I like the yellow too. I love blankets that have a lot of different colors in them. Wow, you are really busy! I’ve made a leaves shawl and I really like it. I think you should leave the yellow yarn in the baby blanket. It’s very pretty! Thank you! I will try out how it looks with the yellow. Might take some time till I get there.